"I'll see you around the quad". So quips Melissa McCarthy in Life of the Party, a gender role reversal version of 1986's Back to School. As a flick about a woman who gets divorced by her other half and then decides to get her degree at the same college as her daughter, "Party" is less risque and far less momentous than "School". 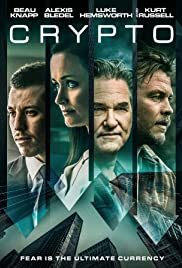 Still, the film provides a few laugh-out-loud moments and that's not what I expect from something with a PG-13 rating (I'm more of an R-rated guy when it comes to comedies). To be frank, Life of the Party is no masterpiece but it's a heck of a lot better than stuff like McCarthy's 2016 vehicle The Boss and Identity Thief. 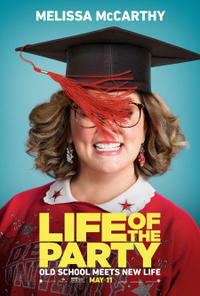 Melissa McCarthy produces, stars, and co-writes "Party". As mid-life crisis student Deanna "Dee Rock" Miles, McCarthy does her same old shtick via a female version of Vince Vaughn and the late Chris Farley. This time however, she's a little more likable due to the fact that "Dee Rock" wholly loves her child and her ex-hubby's such a verbose a-hole. In truth, you kinda feel for Melissa's character and despite her obligatory use of grating dialogue and over-improvisation, you as the viewer almost completely let it slide. All in all, Life of the Party has McCarthy's Deanna doing shots, bedding a guy half her age, exaggerating in physical comedy, taking I guess one class, and somehow graduating at the exact same time as her twentysomething daughter (Maddie Miles played by Molly Gordon). Yeah "Party's" premise is far-fetched, improbable, just for effect, and totally for show. It cuts considerable cinematic corners and it knows it. Oh well, no need to nitpick when it comes to single-use laugh fests. There's amusing, supporting work here from Matt Walsh and Maya Rudolph (they play Deanna's ex and BFF respectfully). Also, I like the tender dynamic between Deanna and wide-eyed Maddie. Finally, Life of the Party might be the best spot of directing ever by McCarthy's highfalutin husband, Ben Falcone (Lord help us). Bottom line: Despite my mild dislike for Plainfield's favorite girl, I'm gonna go with a strong two and a half star rating. Party Hardy McCarthy!